New York: Analyses Publishing Co, 1909. First Edition. Cloth. Very Good. First Edition. 551 pages. Original green cloth. 4to (8 3/4 x 11 1/2 inches). Professionally recased, inner hinges reinforced. Stain to rear cover. Cloth. The First Annual Number 1909 (the series ran until at least 1920). "After the 1907 crash nearly ruined Moody and many of his investors, John Moody re-emerged with a thoughtful new approach which proved more successful. 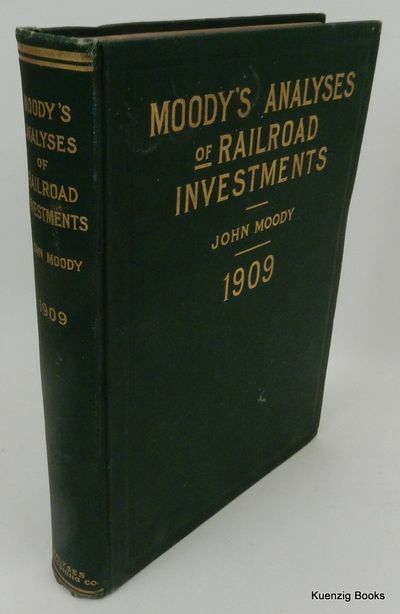 Moody's Analyses of Railroad Investments (1909) improved upon his earlier information-filled reports with full evaluations of company performance and assets... [ another work by Moody, How to Analyze Railroad Reports Offered] insight into his methods; methods which would carry him safely through the 1929 crash and lead his company into continued success in the 21st century." (#465 Bubbles, Booms and Busts, Dennistoun Collection of Works on Speculation from the 17th Century to the Present Day).